The National Leader of the All Progressives Congress, Bola Tinubu, has declared that the party would follow the normal democratic process in choosing its candidate in the 2019 Presidential Election. “No governors can appropriate the power of endorsement to themselves. Buhari is a believer in the process. The Buhari, I know, believes in the rule of law". 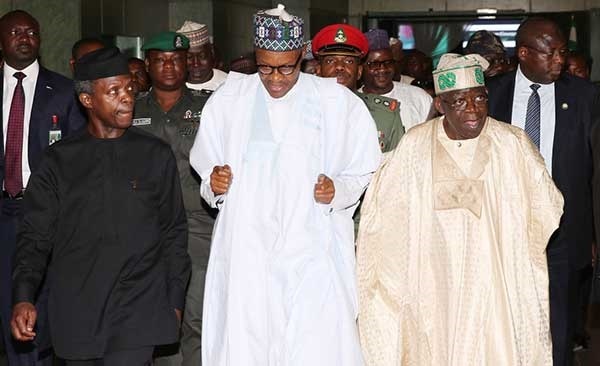 The National Leader of the All Progressives Congress, Bola Tinubu, said this on Wednesday after a closed door meeeting with the leaders of the pan-Yoruba socio-cultural organisation, the Afenifere. The meeting was held at the residence of the leader of the organisation, Pa. Reuben Fasoranti in Akure, the Ondo State capital. He said the leadership of the party had not endorsed President Muhammadu Buhari as its sole candidate for the forthcoming presidential election. His statement was against the recent endorsement of President Muhammadu as the sole candidate of the APC for the 2019 election by the APC governors. Speaking with journalists after the meeting, he said, “We wanted Buhari even before the last convention and primary of the party and Akeredolu is here standing with me, he was not the governor then. He was one of the leading delegates that voted properly and Buhari was a clear winner." He added, “We followed all the constitutional provision and an individual or group’s opinion does not really matter at this stage, Buhari will want a normal process. "Buhari that, I know, who says he will lose at any convention? But if the national body, the NEC (National Executive Committee) and all of us as members endorsed him as our single candidate, we will not be violating INEC regulations, we will not be violating our party constitution".